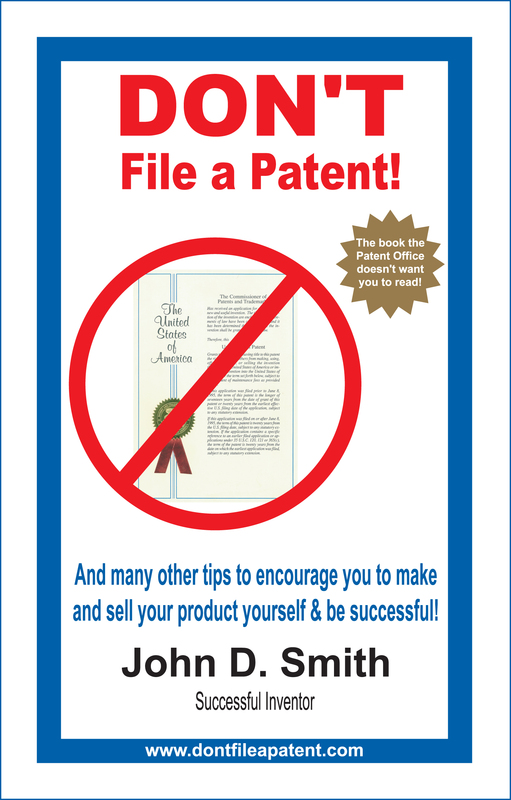 I’ve just finished reading the book ‘Don’t file a patent’ by John Smith and want to share with you some thoughts. For patent office officials the book represents a ‘call for action’. ’Don’t file a patent’ gives yet another example of how an invention that has practical commercial applicability can be stopped from reaching the market because of the bureaucracy found in the administrative arena. This raises the questions… are patents really working towards protecting one’s ideas and are they really helping individual inventors? Because of its circumstantial nature the answer has been the subject of debate among professionals for a number of years and, I must admit, it struck me as naïve for the author to present the situation in black and white and advise solely against filing a patent. That being said, I understand John’s concerns and struggles. John Smith is a typical example of an inventor who dedicated considerable time, money and emotional resources to developing his idea. In seeking help to commercialize his invention he did not find the support needed but rather ongoing costs and numerous administrative/judicial road blocks. The book should be a reminder for patent attorneys that, in their practice, they are often dealing with the life-long work of their clients – advising on projects which can have a significant impact on their welfare. Like John, most of these clients will have limited knowledge of the workings of the relevant judicial and administrative systems and a somewhat naïve opinion about them. It is therefore part of the attorney’s professional obligation to sit down with the client and inform him about the risks and costs incurred with obtaining IP, explain the benefits and long term implications IP brings in clear terms, and go beyond this to question the strategic need of IP protection given the specifics of the client’s circumstances. For entrepreneurs and inventors the book offers a good reality checkpoint together with numerous tips and tricks on how to make your business work (some more relevant than others, some more realistic than others). To this list of tips I would like to add another one. I would like to encourage inventors to look for commercial sense and strategic thinking when choosing a patent attorney. How to recognize a IP strategist? An IP strategist will normally go beyond legal matters and consider educating his clients to think strategically about IP in essence helping him succeed in the market on his own terms (whether through competing using IP, securing distribution channels, partners and optimal speed to market, or other). Great post. Patrick Anderson of GameTime IP also reviewed this book, with similar thoughts. I would add to your advice to inventors in choosing an IP person, if someone does not first ask you “how are you planning to make money on this invention?” you should keep looking. Having seen the book myself, I thought your review very fair indeed. The book is a cry of pain from someone who was badly hurt by the system — and it his pain, rather than an objective account of how the system works — which we should bear in mind when advising smaller and less well resourced businesses whether patents are really for them. Thank you for giving me the chance of reading your book and sharing your experinces with us John..